An expert in Patent and Trademark law, Kirill has gone through all of the necessary stages to earn him a career in this field. In 2002 he was admitted to practice as a Patent and Trademark Attorney, and from 2002 to 2007 he worked as Patent and Trademark Attorney of the IPR GROUP. In 2007 Kirill grew to the position of Managing Partner of the parent company, IPR GROUP based in Ukraine; and in 2010 he was appointed Managing Partner for the company branch offices (the 12 CIS countries). After a successful merger in 2011, he became Managing Attorney of the Patent and Trademark Attorneys of IPR GROUP. His practice in the area of trademarks covers the appeal of decisions of the National Trademark Offices (objections, appeals) and IP Litigation. 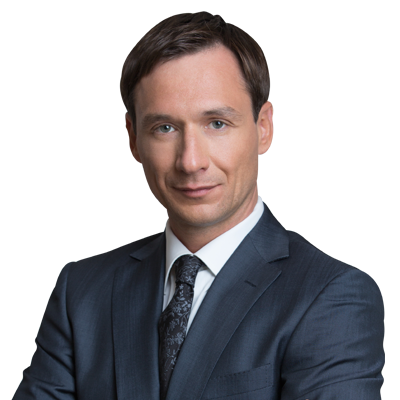 For a span of over 15 years, Kirill has successfully represented clients in courts under various instances and circumstances. These include but aren’t limited to non-use cancelation cases, anti-counterfeiting and bad faith registration cases; he also efficiently interacts with the customs authorities in counterfeiting related matters. He has a vast experience in the investigation of sources of counterfeit in the CIS countries, initiation of police raids and representation right holders within raids. Also drafting claims and further handling cases in courts, entering records on the intellectual property objects to the custom registers, and communication with the customs on the related matters. Kirill has prepared a number of litigation strategies and supervised numerous court cases in Russia, Ukraine, Moldova, Kazakhstan, Georgia and other CIS countries. Within the last 10 years, he has supervised drafting of thousands of Legal Opinions on overcoming provisional refusals for international trademark applications issued by the examination of Trademark Offices of the CIS countries and drafting of objections on provisional refusals. Kirill has handled several set trends for the practice of examination cases for automotive, electronic, pharmaceutical and chemistry well-known manufacturers. He has so far supervised a number of pharmaceutical trademarks portfolios of originators and generic manufactures for registration, licensing and assignments in the CIS countries. From 2013 Kirill began managing the IPR GROUP head office in Moscow, Russia and supervising the operative office for the CIS countries located in Kiev, Ukraine. And in 2014 his duties included the strict management of the patent team of the IPR GROUP, focused on national entries of PCT applications to Russia, Ukraine, Kazakhstan, Uzbekistan and other CIS countries and regional entries of PCT applications to EAPO. His expertise includes drafting responses on the requests of substantive examination of Patent Offices. This work is linked to main areas of modern industries and technologies like chemistry, pharmaceutics, electronics, telecommunications, and automotive industry. Kirill manages efficient business development alongside a number of IP firms and IP service providers who are in charge of entering a large number of PCT applications from various industries into the national or regional phases. He has also handled quite a number of court cases for patent invalidations on the grounds of lack of novelty or lack of inventive step. From 2016 Kirill became the acting head of IPR GROUP Investments Foundation; a group of private investors brought together for technological entrepreneurship and hi-tech startups. Kirill has several hobbies, which include literature, history, chess, shooting, and farming. He owns a sheep farm in the Meru County in Kenya, and in addition he dreams of keeping flocks of lama in the highlands of Latin America. 2002 – graduated from the Institute of the Intellectual Property under the State Intellectual Property Service of Ukraine. Admitted to practice as Patent and Trademark Attorney.